Leprechaun Christmas ornament features the luck o' the Irish with a pot of gold and shamrocks. This Irish Christmas ornament is made of mouth blown glass that has been reverse painted by hand on the inside! 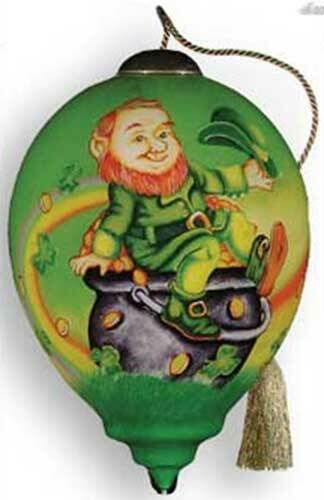 This Irish Christmas ornament features a leprechaun sitting on his pot of gold. The Leprechaun Christmas tree ornament is 3” tall and is princess shaped. The Irish ornament is enhanced with shamrocks along with a gold tassel cord for hanging on your tree. It is made by Ne'Qwa and is elegantly gift boxed with certificate of authenticity. The leprechaun ornament is complete with a shamrock history card, complements of The Irish Gift House. Ne’Qwa Art is the largest producer of the centuries-old tradition of painting on the inside of glass. The same meticulous techniques that captivated emperors and art connoisseurs ages ago are used to create each of our decorative accessories. Ne’Qwa Art has brought this ancient art form together with fine art from premier North American and European artists to create exquisite, year-round home décor. After all…true beauty comes from within. Claddagh Christmas ornament features a bell shaped design that is enhanced with shamrocks along with Celtic knot-work.